This is a list of scientific papers on junk DNA that you need to read (and understand) in order to participate in the junk DNA debate. It's not a comprehensive list because it's mostly papers that defend junk DNA and refute arguments for massive amounts of function. The only exception is the paper by Mattick and Dinger (2013).1 It's the only anti-junk paper that attempts to deal with the main evidence for junk DNA. 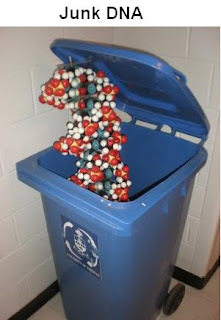 If you know of any other papers that make a good case against junk DNA then I'd be happy to include them in the list. If you come across a publication that argues against junk DNA, then you should immediately check the reference list. If you do not see some of these references in the list, then don't bother reading the paper because you know the author is not knowledgeable about the subject. Ohno, S. (1972) So much "junk" in our genome. In H. H. Smith (Ed. ), Evolution of genetic systems (Vol. 23, pp. 366-370): Brookhaven symposia in biology. 1. The paper by Kellis et al. (2014) is ambiguous. It's clear that most of the ENCODE authors are still opposed to junk DNA even though the paper is mostly a retraction of their original claim that 80% of the genome is functional. Hi Larry Moran how are you? I sent you some emails a while back did they get though? Also the Discovery Institute has posted this on YouTube and a website about this as well. Sorry made an error on the previous comment. "Perhaps the most striking result of this study is the vast number of transcripts that appear to have no function at all. Across all data sets and all tissue types, we observed over 30 million distinct transcripts in approximately 700,000 distinct genomic locations, of which only about 40,000 (5%) appear to represent functional gene loci." "Similarly, the vast majority of the transcript variants themselves also appear nonfunctional. Although this study greatly increases the number of isoforms of known genes, the 323,824 transcripts reported here represent just 1.1% of the 30,467,424 distinct transcripts observed across all 9,795 data sets. This suggests that the splicing machinery too, like RNA polymerase, is highly nonspecific in its actions, in agreement with previous studies that found that the vast majority of observed splice variants correspond to errors." I saw the paper. It’s very interesting but I decided to make a policy of not commenting on unpublished preprints. I’ll wait until it appears in a scientific journal.